The Society’s small museum is in the coach house and basement rooms of Kelmscott House. William Morris lived at Kelmscott House from 1878 until his death in 1896 and the main section of the house is still a home today. The coach house is now our seasonal exhibition space. We hold events and exhibitions of work by Morris and those inspired by him here but much has happened in this room; Morris started to weave his first carpets here, and when he became active in politics, the coach-house became the meeting place for the Hammersmith branch of the Socialist League. Our basement rooms have an extensive Morrisian reference library, showcase changing displays from our collection as well as Morris’s original Albion printing press used in the production of the Kelmscott Press Chaucer, Morris’s last great creation. The majority of The William Morris Society’s collection originates from the generous legacy of Mrs Marion Helena Stephenson, who also bequeathed Kelmscott House to the Society as a fitting location to study and appreciate her artefacts. We hold the archives of the Society, the Kelmscott Fellowship and the Women’s Guild of Arts. Founded in 1918 with May Morris as its first President, Emery Walker and AH Verstage, the Kelmscott Fellowship was the forerunner of The William Morris Society, and they merged in 1966. With May Morris at its first President, the Fellowship aimed to keep Morris’s legacy alive through a series of events and exhibitions, and through an active membership which included Walter Crane, Georgiana Burne-Jones and Emery Walker. The Women’s Guild of Arts was established in 1904 as a reaction to the lack of professional art organisations willing to admit women. 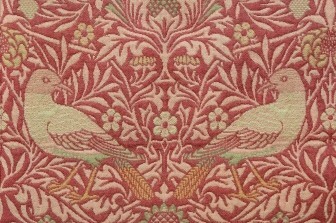 May Morris was responsible for organising the May lectures and events that appealed to a wide range of craftswomen. The archive includes minutes of meetings, accounts and membership lists. The collection contains a number of Kelmscott Press titles and working proofs as well as the only printing press used by Morris left in the country. Dating from c.1835 it is fully operational and used on a regular basis by our artist in residence. The Society has a comprehensive collection of Morris and Company wallpapers, watercolour designs, and a selection of textiles, ranging from a Hammersmith rug and woven hangings to printed cottons, silks and embroideries. For research enquiries regarding the archive and collection please contact the Curator.